Moving faster and in exclusive style is evidently something we'll be paying for the privilege of in MMORPGs from now on. Sony Online Entertainment wants to get a piece of the $50 trillion or so Blizzard made by selling an in-game celestial horse mount for $25. SOE recently made its own exclusive EverQuest II mounts available for purchase on the Station Marketplace for the first time. 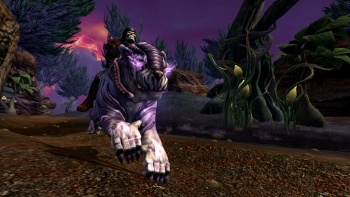 For $25, players of EverQuest II are now able to buy one of two versions of one of three Prowler mounts: the Ethereal Prowler, the Sinister Prowler, and the Ulteran Prowler. They come in Fierce and Arcane flavors, with the bitter Fierce version increasing physical skills, and the salty Arcane version increasing the mystic arts. Sony says that the mounts will be available for "at least one month," perhaps trying to tease players to infuse the company with cash quickly before the mounts disappear. It's hard to imagine that SOE's mount sales weren't entirely inspired by the success Blizzard had with its celestial horse pimping, meaning Blizzard has definitely set a precedent here. Basically, if you run an MMORPG and aren't selling exclusive mounts for real cash, you probably hate money. We're going to see a lot more of this in the future, no doubt, but ideally it won't go too far and will remain in the zone of the cosmetic in pay-to-play MMORPGs.